These pages are showing current condition and the (slow) progress of restoring my Jaguar Mk2 to usable (summer) car. 1961 Jaguar Mk2 3.8L MOD "Ms. Moneypit"
In line six cyl 3.8 litre XK-engine with double over head camshafts and twin SU HD6 carburettors, 225 hp @ 5500rpm, 125mph (201km/h) top speed, 0-60mph (96km/h) in 8.5s. Fastest saloon of it's time. 4-speed Moss manual transmission with Laycock de Normanville overdrive, 1st gear unsyncronized, limited slip differential. Vacuum servo assisted disc brakes in all wheels. Total 83976 Mk2 (all variants) manufactured between 1959-1967, 14757 of them were 3.8 LHD like mine. Old English White (Cream) with Old Beige interior. Manufactured March 10th, 1961 and shipped to Jaguar Cars New York on March 22nd. Sold to Mr. W.E. Buck in Boulder, CO. Details unknown, but at some point car ended to San Diego, California. Some sort of restoration (vinyl interior, poor respray, engine swap) somewhere around 1994 (based on CA plates 3KZR..). I bought her Feb 2000 and shipped the car to Finland June-July 2000. 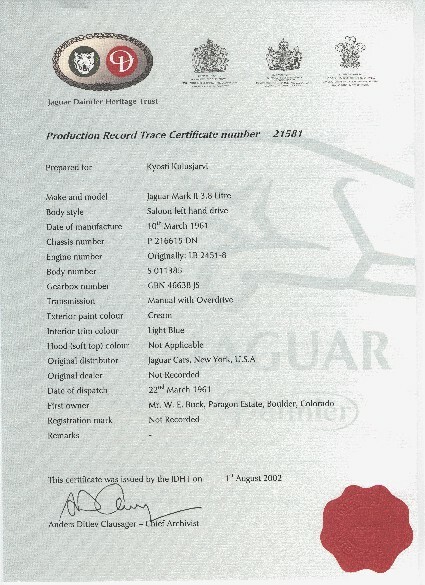 Registered in Finland May 2002. Restoration continues.